The Pew Research Center Internet Project did a survey of teens who use social media to explore how well they understood privacy. For an interactive, we wanted to challenge parents to see if they knew what their children were sharing online. 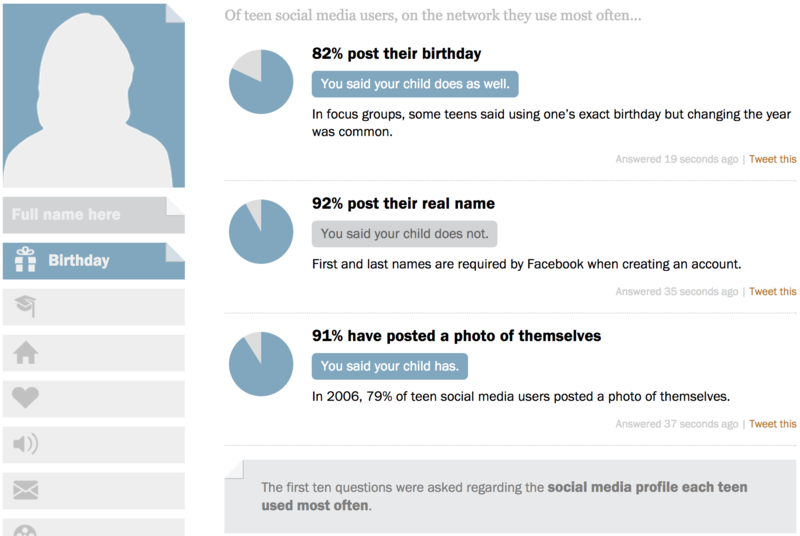 Yet we also knew that non-parents would want to use this interactive, so it starts with the question “do you have a teenage child using social media?” Depending on the answer we reword the questions and feedback. After answering, we explain the data point to the user and allow them to tweet the specific finding. This particular type of interactive has not proven popular among users, but our researchers enjoy how well it connects users with our findings.